The Christian Metal/Rock duo's sophomore album (in a slim digipack) is closer to traditional Heavy Metal yet keeps a variform concoction of structures allowing it to remain fresh over the long run; this respect of the tradition is perceived both soundwise and in the smooth songwriting, and consider that it is a self-released and self-recorded platter. "For the Weary" is fiery and hypnotic Hard Rock not too distant from some Monster Magnet, alongside Prog Rock veerings and vocals capable of catching the attention always present; a Punk intermezzo, an original riff and Maidenian strokes conclude the song together with a final axe solo. Magnetic and probably the best, "Submit to the Divine", contains a headbanging riff alternated with a psychedelic moment, while the sublime bass work stands out all along the composition. I hear something familiar with Metallica's "Black Album" at the beginning of "Imaginary Things", even tho the vocals are really different from James Hetfield's; this track conquers the listener immediately thanks to an ardent main riff and the refrain. "The Hole" has a dreamy start, then a King's X-like riff reappearing shortly two minutes later, but afterwards The Finite Beings' style emerges once again; there's much more inside of this fifth track: Iron maiden echoes, a fast heavy frame reminding of Jag Panzer and finally reminiscences of Black Sabbath followed by an acoustic closure. Another highlight, "Make A Decision", seems coming out of the first album sessions, but this time the drums have more impact, there's a refrain making the song fit for a video and a notable six-string solo! I like all the lyrics, but especially these ones urging to hold the reins of one's life once and for all. Surprisingly, "A Taste of Conflict" is comprised of Reggae (!) parts, Beatles recollections and a rocky drumwork being our companion during most of the length; there's also a weird insertion dear to System Of A Down's fans before the hammering and the temporary angelic vocals. "Rejuvenate Me" uses piano, delayed vocals and a slightly distorted guitar layer within the first section in order for the ballad to be dedicated to the devotion towards Jesus Christ; when the rhythmic instruments come in there's also space for the last guitar solo, indeed long and slow enough, and most importantly, pretty personal. Another masterpiece from the two maestros from New Jersey that doesn't deserve to pass unnoticed or remain in the background compared with big names of the genre. A cover version of Led Zeppelin's classic was released in late March 2015; pretty faithful to the original, the main differences reside in the vocals, some guitar sound more otherworldly than the Rock and Blues original song in the acoustic part, while the rest is decidedly more Metal than Rock and the guitars fill the song up more than the original; the solo is up to Jimmy Page's. Very pleasant work, although it's a Christian parody, it turns out highly enjoyable; it must be God's hand leading them to these celestial peaks, since everything the duo touches becomes gold! 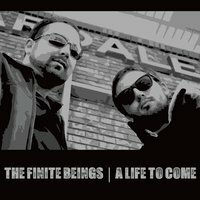 The song contains all of The Finite Beings' elements, showing a few differences at the same time: for the most, except for the guitar solo, it is an acoustic soothing composition, but this time the vocals have been recorded very raw and plain and not everybody might like this choice representing a novelty in comparison with the band's refined and still powerful older material. Secondly, there are parts after the solo and before the end that definitely remind of the most intimistic Pink Floyd. Still, the lion's share is constituted by the cinematic arrangements that give the song the depth it needs to remember and celebrate the passing of the nth friend to a hopefully better existence. If you know the NJ act's previous music you won't be disappointed, but if you're new to them, although not a crime to listen to "Brother", the ideal would be to start from the beginning of their career to better understand their evolution. Donny DePaola - v., g., b.
Mike Nicholas - d., v.